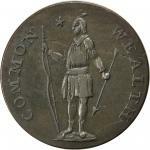 Lot:8018 1787 Massachusetts Cent. Ryder 2b-C, W-6050. Rarity-5. AU-55 (PCGS). 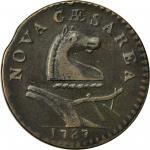 1787 Massachusetts Cent. Ryder 2b-C, W-6050. Rarity-5. AU-55 (PCGS).149.1 grains. 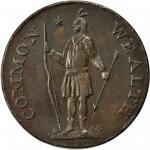 Lovely chocolate brown patina is uniform and glossy on the obverse save for a couple of tiny spots close to the rims. 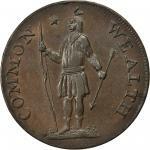 The reverse is similar, though with considerable faded tan through the fields. Only trivial marks are noted beyond a thin reverse scratch that curves over the viewer’s left wing. Well struck with only minor weakness at the centers where the highest areas of relief on both dies were in opposition to each other causing these areas to be softly defined more often than not. Though the obverse die was a bit of a workhorse and used in five different marriages, this reverse was used only in this pairing. The thin intermittent break passing through the M of MASSACHUSETTS and through the first two digits of the date likely caused this reverse to be pulled out of service early, making this variety rarer today. Not only is the variety quite scarce, it is rarely ever seen in nice condition. We have not handled one this nice in years, probably not since our Ford sale in 2004. 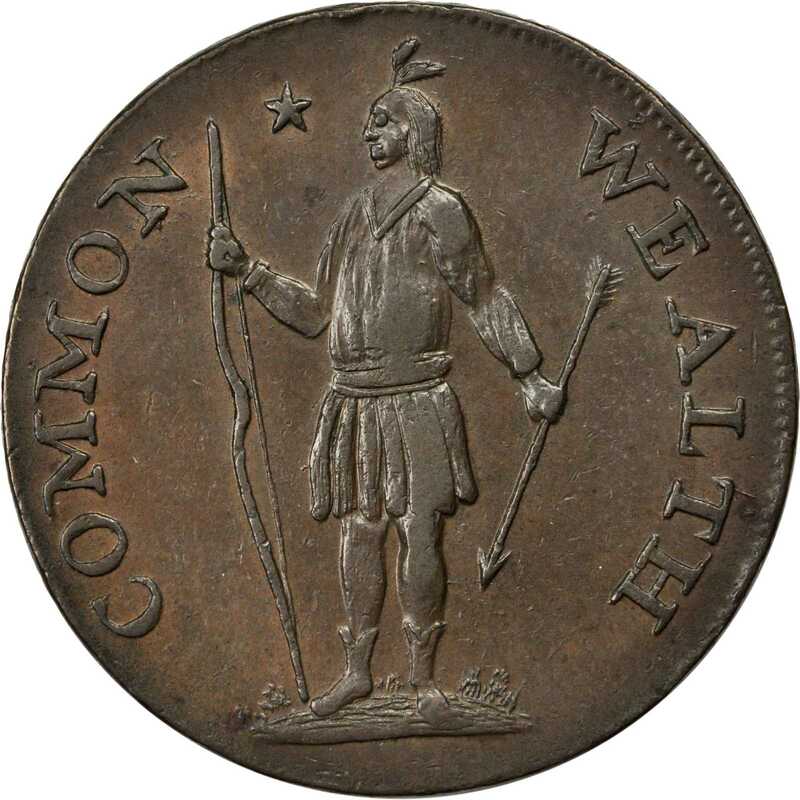 This example is a little nicer than Taylor’s, obviously better than the Eric Newman and Michael Demling coins, and just a hair less sharp than Norweb’s. Garrett didn’t have the variety at all. A most respectable specimen with plenty of sharpness and eye appeal. We do not know where Robert Vlack acquired this, but it has obviously been decades since it was last offered publicly, if ever.From the Twin Leaf Collection of Connecticut & Massachusetts Coppers. Earlier ex Robert Vlack; Tom Rinaldo; Stephen Tanenbaum; Stephen Tanenbaum Estate, via Anthony Terranova, 2011.